•	Tukwila Village NOW OPEN! •	Boulevard Place NOW LEASING! •	Crossroads Senior Living OPENING SOON! SEE WHAT'S NEW AT SHAG! A tremendous amount of opportunities and accomplishments over the last year have set a high bar for our organization. It was a year of countless hours of dedication from staff to our mission of supporting the homes and lives of our residents. This year, we'll take the bar even higher to strengthen our ability to deliver on giving our residents the support they need. We have a lot of exciting projects and initiatives to look forward to as we build on these achievements. Here are some 2018 highlights: •	Deployed “New Eyes for the Needy,” a valuable resource that provides residents with vouchers to cover the costs of eye glass frames and lenses. •	Launched partnership with the Department of Social and Human Services (DSHS) to provide on-site Community Service Officers (CSO) at 12 SHAG communities, who assist residents in obtaining critical government benefits. •	Updated the Resident Activities Fund (RAF) policy and procedures. •	Completed and launched SHAG Community Emergency Readiness Protocols and Policies (ERPP). •	Strengthened instrumental partnerships with Sound Generations, the University of Washington, Pacific Lutheran University, Homage, the Department of Health, King Conservation District, Stop Bugging Me Pest Control and the Korean American Coalition. •	In July, we partnered with the City of Tukwila to celebrate the opening of the Sullivan Community Center and commemorate the culmination of a 20-year vision to transform a formerly challenged stretch of Tukwila International Boulevard into a vibrant community. We have a lot more in store for 2019 and cannot wait to share with you what’s ahead. Health Advocate Pilot Program To better meet resident needs for healthcare information and resources, and to maximize Resident Services support utilization, SHAG has initiated a four-month pilot program, offering on-site Community Health Advocacy services to residents of Shorelineâ&#x20AC;&#x2122;s New Haven and Kirklandâ&#x20AC;&#x2122;s Woodlands at Forbes Lake. Residents Will Benefit From: 1) Resources To help improve healthcare experiences and outcomes by sharing relevant healthcare resources and contacts, including researching availability, and contact information for qualified generalists and specialty providers. 4) Personal Advocacy Coaching On how to make the most of medical appointments through advance preparation, note-taking, document organization, and how to advocate for oneself and others as paying customers of the healthcare system rather than as passive recipients. 2) Medication Education On how to organize daily/weekly self-administration; how to formulate and articulate medication questions to providers. 5) Healthcare Document Navigation To help with the potentially challenging process of completing and filing Advanced Directives and designating important decision-makers. 3) Insurance Answers To questions (as possible) related to benefits, costs, disputes, etc. Timing: The pilot will be conducted from January 7, 2019 through April 26, 2019. HAVE QUESTIONS ABOUT VETERANS BENEFITS? Seniors 60+ with low-incomes may be eligible for $40 in vouchers through the 2019 Senior Farmers Market Nutrition Program. HOW TO APPLY: Beginning April 8, visit: www.agingkingcounty.org/SFMNP Where your friends live. See what seasonal bounty you can find to incorporate more fresh fruits and veggies into your diet. Set aside some â&#x20AC;&#x153;mind timeâ&#x20AC;? in the fresh air each day to meditate or journal to improve mood and reduce stress. Hula hooping, skipping, swinging and other playground exercises are great ways to burn calories and put the fun back in fitness. Garden clubs are a staple of many SHAG communities, but Tri-Court exemplifies cross-community collaboration. Tri-Court residents have long been interested in a garden club but didn’t know where to begin. After learning about the bountiful garden at Conservatory Place, Patti reached out to Jill Mohr, a certified Master Gardener at Tacoma’s Conservatory, to pick her brain and foster a connection. Tri-Court garden club members along with King Conservation District took a trip to visit Conservatory in November. Together the two teams had a melding of the minds – ate lunch together, asked questions – and traded gardening tips. A standout feature of Conservatory’s garden is their “garden to table” model. The garden grows enough produce to donate fruits and vegetables to fellow residents, and host community dinners using garden grown ingredients. With the mentorship of Conservatory Place, Tri-Court is hoping to develop a community garden of their own that produces enough food for residents and to donate to local food banks. The three-building campus will begin planting in April. 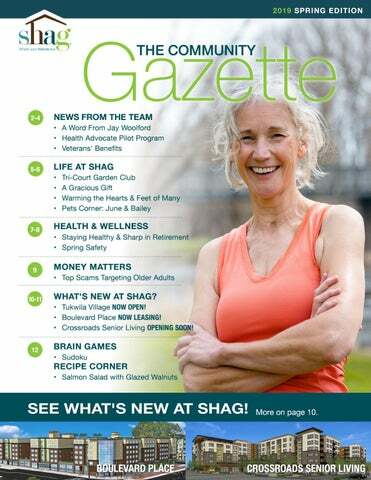 As Steve Moran of Senior Housing Forum, CEO Jay Woolford and COO Karen Lucas, were visiting SHAG's Meridian Court Apartments, they were told that the community’s vending and washing machines were vandalized, and the community’s Wii was stolen. Without hesitation, Steve ran over to Game Stop and purchased a new Wii for the community room. Thank you, Steve for your amazing generosity! Warming The Hearts And Feet Of Many Arrowhead Gardens has been donating socks to those in need during the holidays for several years. This year, they chose to help The Duwamish Valley Youth Corp (DVYC). The kids were invited to the community to “help” the residents, or so they were told. Instead they were greeted by Santa and enjoyed cake and hot cocoa. The residents learned more about the DVYC, and then presented them with hundreds of pairs of socks, dozens of stocking caps, gloves, scarves and new jackets. So far, Arrowhead Garden residents have donated well over 2,000 pairs of socks, as well as hundreds of pairs of gloves and hats - many made by hand! "The best part of 2018 was building an ongoing relationship with the kids of the DVYC. We are going to partner with them on our P-Patch Program. They will be here to help clean and get them ready for planting. We are looking forward to working with these kids; it’s going to be great!" love. He is a terrier mix that I rescued eight years ago when he was four. Since he is a small dog the Google chart says he is 64 dog years old. That's good because we have a lot of living to do. Staying Healthy & Sharp in Retirement Health is not just the absence of illness, it is a complete state of well-being. Here are a few simple ways to get on the right path. 1. Stay active Keeping your mind and hands occupied will go a long way in keeping you healthy and sharp. Dust off old dreams and hobbies. Start that memoir you’ve always wanted or revisit your band days. 2. Learn new things, and see new places The phrase, “you can’t teach an old dog new tricks” doesn’t apply. You're just as capable of learning new things and thriving in new environments, plus you have the wisdom that comes with life experience. Staying adventurous and open to new experiences keeps you sharp and young. 3. See your doctor A lot of older adults enjoy vigorous health, often better than many younger people. However, doctor visits should be a regular part of your preventative lifestyle, not just a result of being sick. 4. Eat healthy If you've never been a healthy eater before, it's never too late to start. Try to eat whole grains, fruits and vegetables, lean protein, and drink plenty of water. Desserts aren't off limits, but eat them in moderation. Spring Safety According to the Center for Disease Control, nearly 70% of physically active older adults reported walking as the type of exercise in which they had spent the most time during the past month. Trust your gut. If you are having an "off" day, you are unwell or you feel like your balance is off, do not head out. The risk of injury for seniors in a fall is significant and can sometimes be lifechanging. With more people out and about in the warmer weather, there is often an increase in pedestrian accidents. In fact, 19% of pedestrian fatalities and an estimated 13% of all pedestrians injured in 2015 were ages 65 and older. If you need something, see if a neighbor or friend can pick it up or be delivered if possible. Your health and well-being are too important to risk. If you're walking more this spring or using public transportation to get around, make sure to follow these safety tips: Mind what you wear. Your clothing choice can go along way in helping you to stay safe. Wear bright colors or reflective gear and ensure that your shoes allow for comfortable walking. Make eye contact. Pedestrians do not always have the right of way when crossing midblock. Instead, make sure you only cross at intersections and before you go, look the drivers in the eye so you know that they are paying attention to you. Source: Modified from "Pedestrian Safety Tips For Walking In Seattle", Max Meyers Law. This Internet scam promises specialized medication at a fraction of the cost. In addition to purchasing unnecessary prescriptions these unknown substances can cause more harm than good. TIP: Only purchase your medications at the guidance of your doctor or pharmacist. It starts with a phone call, “Hi grandma/grandad, do you know who this is?” Once the unsuspecting grandparent guesses, the scammer assumes the identity. The scammer asks for financial help with an emergency, to be paid via a method that doesn’t always require ID (Western Union or MoneyGram). TIP: Ask family related questions that only your grandchild would know. This scam commonly involves the scammer sending an e-mail asking to update or verify important information for the IRS or Social Security, for example. The email has a link to a page to enter your information. Once you submit, the scammer has your personal information. TIP: Don’t click links from unknown or suspicious sources. unlock the “prize”. They send a (fake) check to be deposited in your bank account, knowing that while it shows up in the account immediately, it will take a few days before it is rejected. During that time, scammers continue to request fees or taxes, and the check bounces. TIP: Winners do not have to pay to receive their prize! Your phone rings and caller ID shows that it’s the SSA calling from 1-800-772-1213, which is in fact the correct SSA number. The caller says he/she works for the Social Security Administration and needs your personal information – like your Social Security number – to increase your benefits payments. (Or threatens to cut off your benefits if you don’t give the information.). TIP: SSA employees may contact you by phone for customer-service purposes, or to request confirmation of personal information over the phone. However, SSA employees will never threaten or promise benefit approval or increase in exchange for information. In those cases, the call is fraudulent, and you should hang up. If you think you’ve been scammed, don’t be afraid or embarrassed to talk about it—waiting could only make it worse. Immediately: •	Call your bank and/or credit card company. •	Cancel any debit or credit cards linked to the stolen account. •	Reset your personal identification number(s). • Planned Social Activities... and More! THE TANSY - Two Bedroom 737 sq. ft.
You've seen the reviews, now come see for yourself! (206) 566-7031 Where your friends live. SEE WHAT OUR RESIDENTS SAY ABOUT HOW MUCH THEY LOVE IT HERE. Dust off your zest for life and come liven things up with us. OPENING THIS SUMMER! Crossroads Senior Living Join us at the intersection of freedom and fun! Diabetic Exchanges: 3 lean meat, 3 fat, 1/2 starch. 1. Brush salmon with 2 tablespoons vinaigrette; sprinkle with pepper. On a greased grill rack, cook salmon, covered, over medium heat or broil 4 in. from heat just until fish begins to flake easily with a fork, 3-4 minutes on each side. 2. In a bowl, toss salad greens with remaining vinaigrette. Divide between two plates; sprinkle with walnuts and cheese. Top with salmon.